Aren’t we all interested in affordable ways we could be doing better in search engines? From time to time, you probably Google some words that relate to your business to see what results you get. Have you ever been surprised, or somewhat disappointed, if your business does not come up like you were expecting? Before you throw up your hands, take a moment to identify the root issue. Likely, the solution is simpler and less expensive than you’d think! Gearing your site to search engines (“search engine optimization” or SEO) is an in-depth topic, and for our purpose today, we are not going to address ranking – that is, the placement of your site in relation to other sites. This article deals with search relevance only. Within the scope of relevance, if your site doesn’t appear as a result for a term you think it should, that means the search criteria entered does not relate to your Web site. There are four roadblocks that commonly prevent your site from being included in a seemingly relevant search. Understanding and addressing these can help your Web site’s presence in search engines. When entering an example search for your company or product, start by noting exactly what you are typing. A fundamental misunderstanding is that search engines are more intelligent than they really are. Even considering recent advances, the level of intelligence built into search engines is limited. In fact, search engines are quite literal. Having two words appear on the same Web page does not mean that a search engine will connect them as a phrase. For some words, search engines may not know the difference between singular and plural. Beyond their fundamental programming, they certainly can’t interpret the connection between concepts. Why is that so? Remember that technologies, like the Internet, do not have capacity for human reasoning. They function on literal data. Search engines do not know what words you intended to include on your Web site. They only understand what is actually input. Therefore, if certain wording wasn’t specifically published on your Web site, a search engine is unable to identify your site with those words. This cannot be overstated. If you want your site to appear as a result for a commonly used pair of words or a specific phrase, quite simply those words have to be present in that exact configuration on your Web site. ‘But I’m sure we’re using those words already,’ you may reason. Do not make the mistake of assuming that a seemingly basic word or phrase actually exists in your Web site’s written content. Check it out yourself. Isn’t it worth it to take a couple of minutes to ensure your content is truly complete, rather than risk losing a customer to insufficient search engine results? Search engines can only search through the exact content you publish. If important words on your site are absent or misspelled, the search engine will not interpret what you meant to say. So be diligent and detailed when writing your content. Proofread carefully, watching for errors in spelling or grammar (as grammar often influences the selection of spelling variants). If you have been a poor speller since grade three, and you haven’t yet befriended spell check on your computer, then get someone else to help you. This is necessary if you want your Web site’s content to work for you. Remember, writing skills can be improved over time. But typos will stay typos until you make the effort to correct them. When you open a telephone book, you can be confident you will only see listings that are pertinent to your area. Not so with a search engine. A search engine doesn’t know where the user is searching, or where a given business is, unless it is defined on both ends. Even when a person enters a local search term, the most popular or authoritative sites containing that term will appear. The results are not sorted based on geographical distance. 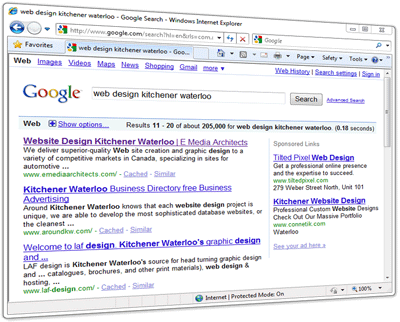 For example, sites containing the word “Kitchener” will not resolve for a search performed for “Waterloo” unless the site contains both terms. Likewise, if a user enters a locally understood term, like K-W, it won’t automatically be associated with Kitchener-Waterloo. How can you improve your local presence? Publishing your proper business address on your site is basic. But mentioning it on one page does not mean that every product or service mentioned elsewhere on your site will be connected to that locale. Ensuring that proper names, short forms, and vernacular variants of your location’s city, region, and province are integrated in your general written content and page titles can help. The goal is to connect the product or service to the area. In addition to the actual city used in your address, also consider including the names of nearby villages and towns you want to attract. Mentioning these in special promotion text, articles, or blog posts on your site is a good way to get these words out there. You may also wish to discuss with us getting listed in relevant geographically-based Internet directories to further cement your site with local searches. When we say that your content needs to be regularly updated, this is the truth. This is not us trying to get you to spend your money; this is us trying to help you stay alive in search engines. Why this need? Once a site is published, the content naturally begins to age, and search engines view it as less relevant. This decline is further amplified as your competitors continue to update their sites with fresh content, making yours even less relevant – from both a search engine and a human perspective. The effect is that your site draws less visitors and has less presence in search engines. Striving to maintain your presence in search engines is like physical exercise – it would be great if you could just pay someone to do it for you, or take a magic pill, but it doesn’t work like that. Unless you regularly do the work to maintain your fitness, you naturally lose it. Google AdWords and similar services may seem to be the magic solution (and they do have merit) but to use them well, these need to be understood for what they are – advertising. They draw attention. But they are not a substitute for high-quality, keyword-rich content. Realize, too, that as industry terms, product names, and other pertinent information changes, search engines do not realize that the old terms and the new terms are connected. So when a word or phrase has been transitioned, you must be sure it gets changed to its new form on your Web site. Otherwise, your site will not be deemed relevant when the up-to-date term is searched for. So periodically take time to review and refresh your content. Start by talking to us to find out what aspects of your site content could be improved with search engines in mind. Also consider how you could make room for features, such as news, a blog, articles, or even weekly specials, that might be frequently refreshed with pertinent wording and topics. One key phrase is used constantly in the Internet community: “content is king.” This is the broken record coming from all levels of Google. If you want to retain your presence or become more relevant in search engines, write suitable, accurate, high-quality content and keep it fresh. That’s the single best – and perhaps the most affordable – thing you can do for your business. Addressing these simple roadblocks need not cost much or occupy a lot of time. But properly directing your efforts toward maintaining and improving your online investment will cumulatively reap long term benefits in maintaining and improving your site’s relevance in search engines.